Pope Francis isn't above sharing the spotlight with others. 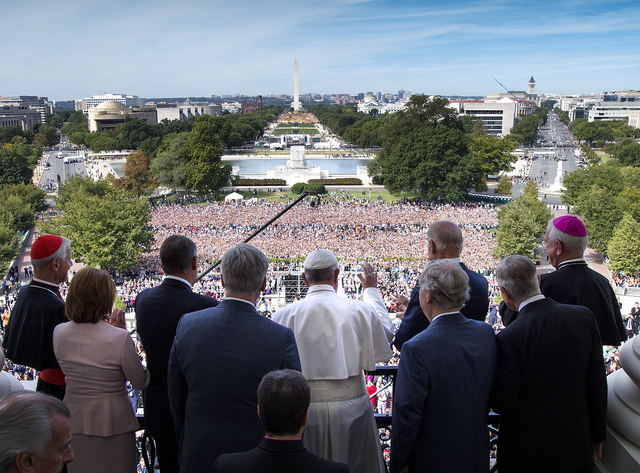 The pontiff structured much of his historic speech to Congress by highlighting the work and lives of four Americans. Two are universally known -- President Abraham Lincoln and the Rev. Martin Luther King Jr. -- while two others may prompt a flurry of Google searches. Dorothy Day, the founder of the Catholic Worker Movement and known socialist, and Thomas Merton, a U.S. Catholic writer. Pope Francis also touched on some larger issues, including divisive ones like climate change, the death penalty and threats to "the family" and marriage. The policy issue to get the most attention from the pope, however, was immigration and the refugee crisis. Using a maxim that everyone could understand, he cited the Golden Rule, which originates from the book of Matthew. "Our world is facing a refugee crisis of a magnitude not seen since the Second World War. This presents us with great challenges and many hard decisions," Pope Francis said, adding later that "Let us remember the Golden Rule: 'Do unto others as you would have them do unto you.'"